Okay this was tough as I walked around my movies thinking of my favorites, if I did that we would be here for days. So what I did was the first "10" I could think of must be my best, considering those were the first my brain had chosen. I wanted to thank Ellie @ "http://elliegarratt.blogspot.com" for helping make this all possible, she is a very cool person whom I only met maybe six months ago. One with my show, thanks everyone! Conan's Father: Fire and wind come from the sky, from the gods of the sky. But Crom is your god, Crom and he lives in the earth. Once, giants lived in the Earth, Conan. And in the darkness of chaos, they fooled Crom, and they took from him the enigma of steel. Crom was angered. And the Earth shook. Fire and wind struck down these giants, and they threw their bodies into the waters, but in their rage, the gods forgot the secret of steel and left it on the battlefield. We who found it are just men. Not gods. Not giants. Just men. The secret of steel has always carried with it a mystery. You must learn its riddle, Conan. You must learn its discipline. For no one - no one in this world can you trust. Not men, not women, not beasts. [Points to sword] Conan's Father: This you can trust. Betelgeuse: Ah. Well... I attended Juilliard... I'm a graduate of the Harvard business school. I travel quite extensively. I lived through the Black Plague and had a pretty good time during that. I've seen the EXORCIST ABOUT A HUNDRED AND SIXTY-SEVEN TIMES, AND IT KEEPS GETTING FUNNIER EVERY SINGLE TIME I SEE IT... NOT TO MENTION THE FACT THAT YOU'RE TALKING TO A DEAD GUY... NOW WHAT DO YOU THINK? You think I'm qualified? [Aragorn is crowned King] Aragorn: This day does not belong to one man but to all. Let us together rebuild this world that we may share in the days of peace. Dr. Philip K. Decker: [smirking] Quite a dance huh? Death everywhere and you and me in the middle! Poltergeist - Carol Anne: They're here. [Upon getting the powered glove in place of his right hand] Ash: Groovy. Highlander - [Saying his farewell to Rachel] Connor MacLeod: Hey, it's a kind of magic! Pet Sematary - Gage: No Fair! No Fair, No Fair! Spock: ...Or the one. I never took the Kobayashi Maru test until now. What do you think of my solution? Spock: I have been and always shall be your friend. Kevin Lomax: "Better to reign in Hell than serve in Heaven", is that it? John Milton: Why not? I'm here on the ground with my nose in it since the whole thing began. I've nurtured every sensation man's been inspired to have. I cared about what he wanted and I never judged him. Why? Because I never rejected him. In spite of all his imperfections, I'm a fan of man! I'm a humanist. Maybe the last humanist. Hey....I didn't know the Kobayashi Maru was in one of the original movies!!!!! Sweet! The Poltergeist line is such a classic and it was ringing in my head when I compiled my list, but I decided not to go with it. You have some interesting choices here and a few from movies I've never heard of. Love the Beetlejuice line. My post will appear at 2 AM California time. I loved Buckeroo Bonzai!!!! but I couldn't remember any of my favorite quotes when I was signing up and coming up with quotes! and I almost chose that one from Wrath of Khan myself! Lol!!! nice quotes! Thanks to you and Ellie for hosting this! An awesome list, Jeremy. And of course it included one of the most emotional scenes in film history - the death of Spock. I get teary at the thought of it. Thank you for co-hosting this one with me, it's been an absolute pleasure. You are an inspiration to us all! Quite the variety! "Groovy" was my second pick from Evil Dead II. 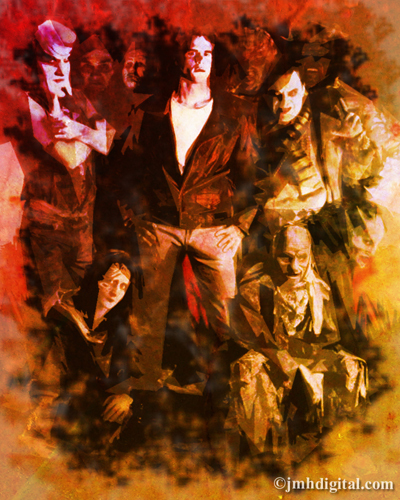 Nightbreed had some good ones. Saw a Psych episode the other day where the characters referenced NightBreed, and I be most of the viewers had no idea what they were talking about! Great list. I didn't do so well on the horror side. great quotes - especially love that last one - and thanks for hosting the blogfest! Yeah, yeah, yeah. I'm jumping up and down cuz I like these. Go LOTR, and Devils Advocate and Trekki's and OMG I thougt no one but me remembers Highlander. Good list! I almost included that Spock/Kirk quote on my list, but opted for another Spock quote instead. Of course there's the always infamous: KHAAAAAAAAN! You found some classic quotes and few that you dragged in from left-field ;)Beetlejuice had a few contenders for my list too. I was quoting something from Highlander just yesterday. Probably cause the Kurgan was in a show I was watching. Great list! I totally forgot about Beetlejuice! Love that movie! Any list that starts with "the riddle of steel" rocks in my book! I ruled out another Conan quote because I was thinking science fiction, not fantasy. "To crush your enemies, see them driven before you, and to hear the lamentations of the women"
Great list. I must admit I haven't ever seen Nightbreed, but I'll have to check it out. Thanks for co-hosting this blogfest! It was a lot of fun. I can't believe I forgot Highlander! There's so much to love in that film. The quote you chose was great! Well done! I love the Conan The Barbarian, Beetlejuice and Wrath of Khan, too. Love the Beetlejuice quote - I MUST watch that again! The others give a general wistful, thoughtful feel. Middle Earth, not giants but men... and poor old Spock. Aw bless! Great list, great movies. I forgot Poltergeist. Great quotes. Buckaroo Bonzai is an awesome film. Love the ones from LOTR, Nightbreed and Army of Darkness. That Spock quote is even better in context. I still remember him adjusting his tunic as he dragged himself upright. The vision of dignity.